Odylique concealer is my first natural concealer and now that I’ve been using it for a few months I don’t know how I survived without it. My combination skin is prone to breakouts and every month I tend to get hormonal spots so I do need a good makeup to disguise these. Before I bought Odylique natural concealer I used only natural foundation to conceal my imperfections. But I’ve been meaning to get myself a proper natural concealer for ages as it should be better at concealing than just a normal natural mineral foundation. I decided to pick Odylique organic concealer from LoveLula as I read some positive reviews online and because it was designed to calm irritable skin and at the same time moisturise it. Odylique concealer is multifunctional so you can also also use it on scars and dark circles and as a highlighter. What’s more, it’s certified organic by The Soil Association which was another reason why I wanted to own it. 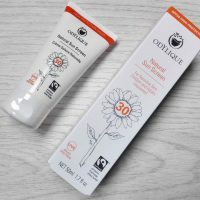 I have previously tried several different Odylique beauty products and most of them are really good so I had high hopes for Odylique natural concealer. I received the concealer in an older packaging – Odylique by Essential Care has rebranded a while back (previously the brand was Essential Care). Never mind the older packaging, the concealer was still perfect to use. There were two different choices when it came to the colour of this concealer and I went for ‘fair‘. I thought that the lighter concealer would work better on my red spots. But now I think it’s a little bit too light, however after blending in you cannot see that. If I was buying this concealer again I would definitely pick a shade darker, the ‘medium‘ version. So these are the two main choices you have when it comes to colour/shade and I am not sure whether it’s enough choice for all the different skin colours out there. But you don’t normally use concealers on their own anyway – normally you add a natural foundation on top or a settling powder, so if the colour is not exactly right for your skin, you can still make it work. In terms of the coverage, I had quite high expectations as it’s marketed as a high-coverage concealer. But I was slightly disappointed. From my experience, I would say that the Odylique concealer is light- to medium-coverage concealer, not exactly a high-coverage concealer. But it’s really how you use it that makes a difference and gives you different coverage. If you have a big red spot on your face, for example, you can apply the concealer directly onto the spot but don’t try to apply it like a face cream and spread it across the surrounding area if you want a better coverage. For the best coverage, simply gently tap your skin, allowing concealer to blend in and that’s it. This gives you a medium coverage on a red spot (in my opinion) which you can conceal even further by adding natural foundation on top. In this way, the blemish will be perfectly concealed. For dark circles, you simply glide the concealer underneath your eyes. It’s quite soft and glides easily so it won’t stretch your delicate eye area. The dark circles definitely look toned down after the application. What I really like about this natural concealer is that it doesn’t only conceal but it also helps skin to heal as it contains zinc, calendula and moisturising oils. When on the skin, it looks quite natural (not cakey) and the staying power is really good too. I normally don’t feel the need to re-apply throughout the day. This means that it should last you for a quite long time. What I also love about this stick concealer is that it’s so portable and easy to use. You don’t need to carry a brush with it as you can simply dab it in with your fingers. All in all, a great natural concealer which I am happy to recommend. Just make sure you use it with your normal foundation to reach a better coverage. What is your favourite natural concealer? Have you tried this concealer from Odylique?